Drake has always been very proud of 2 things; the city of Toronto where he was born and his time of birth. The latter seems to be the focus for his fifth studio album. From his label and streetwear line October’s Very Own to now with him being a Scorpio and naming his latest album Scorpion. I’m not a firm believer in zodiac signs and you might not be either, but Drake clearly is. I did some quick research on Scorpio’s and here’s what came up. Strengths: focused, brave, ambitious, and intuitive. Weaknesses: jealous, secretive, resentful, and manipulative. There is also sensitivity which can be both a strength and a weakness. A double album is very ambitious. The album cover is a black and white photo of Drake looking forward and it’s signed with his legal name Aubrey Graham. Piecing all of these things together, this album seems to be a self-portrait. Survival is a brief strong opening for the album. Drake sounds focused here and his pen is sharp. Tay Keith provides a menacing beat on Non Stop and while Drake’s delivery is equally baleful this song has some of the albums worst lines. Elevate is a nice standout song with Drake doing what he does best. Emotionless is backed with a gorgeous Mariah Carey sample. Drake takes on the roll of an astute business man that’s borderline manipulative. He analyses the world around him and uses this to his advantage to justify being tight-lipped about his son. I’m Upset might be the only air ball on Part A. The concept just doesn’t hold up with a performance that is more resentful and lethargic than tough and the flow is far too repetitive which makes the 3 and half minute song feel like 6. 8 Out of 10 appears to be the closest thing we’ll get to a Pusha T response. Sunny production and Drake’s flow and delivery are superb. This can be viewed as a sore loser track of sorts as Drake deflects to making a point out of how everyone is still listening to his music and how lucky his enemies are, but ultimately this song embodies a sentiment that rings true throughout the album; you don’t have to agree with Drake for the music to be good. I find myself disagreeing with Drake a lot on this album, but I can’t deny a good song when I hear one. The album finds it’s stride at this point with fun songs like Mob Ties, dazzling flows on Can’t Take a Joke and infectious confidence on Sandra’s Rose. There’s a brief dip on the uneventful Talk Up that’s saving grace is a bold bar from Jay-Z, but Part A ends on a strong note with the introspective Is There More. This song captures an existential moment in Drake’s career and unfortunately, listeners are robbed of what would have been a poetic poignancy if this were the last track of the entire album and what followed was silence, but what follows are another 13 songs. Peak is meditatively soothing and the piercing electric chords are sharp enough to remind you that the relationship was far from smooth sailing. Summer Games is a bit uneventful for a 4-minute song and there’s a missed opportunity to expand the production when Drake’s vocals get distorted on the bridge. Jaded is Drake on his sensitive tip and it’s a song I feel like I’ve heard from him too many times. If the last 10 minutes had your eyes drooping, Nice For What will wake you up. A relatable summer anthem with a positive message. Finesse has a slickly delivered chorus, but I find myself just waiting for the chorus to appear again with the remainder of the song feeling like filler. Ratchet Happy Birthday is a meme song. Funny, fun, made for social media clips, but not meant for actual listening. That’s How You Feel is a crowd pleaser. You can’t help but repeat the catchy chorus and Nicki Minaj brings a refreshing change of pace to the track. Drake brings a smooth delivery to Blue Tint and Future’s eccentric vocals give the track a fun flare, but the song does feel out of place on this disc. In My Feelings is a standout track that is bound to get plenty of plays this summer. The production is tropical and the experimental sampling make the song entertaining from start to finish. Don’t Matter To Me is a great song and using a posthumous Michael Jackson feature is brave. The concept is executed very well and the narrative holds together, I don’t see people having any issues with this song unless they are tied to a distaste for Drake himself. After Dark is silky smooth R&B that’s ready for some late night spins. The second half of Final Fantasy is very intimate and sensual, but the first half is just awkward and the Maury sample doesn’t help. This all leads to the final track March 14. It’s the most personal song on the album, but it doesn’t feel like it. The song is just too easy to ignore. It brings to mind another rapper who addressed a scandal from their personal life; Jay-Z. 4:44 is extremely personal, but you also feel the pain of the situation from the instrumental. There’s a missed opportunity on the production for March 14. It doesn’t make me feel anything, but the story is interesting to hear. 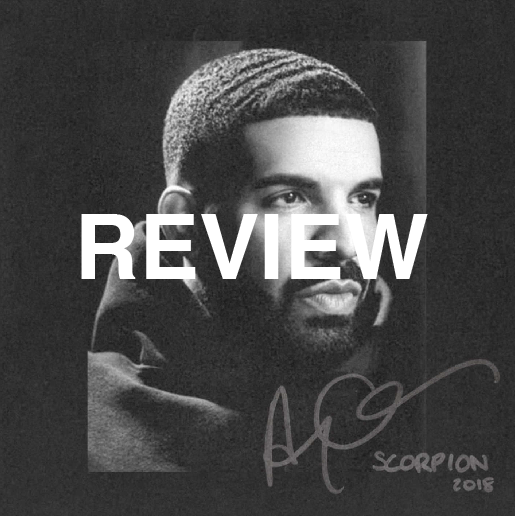 Scorpion is an ambitious self portrait that exhibits Drake's flaws and most redeeming qualities. Like a block of marble, there is a great album in here; a great sculpture, but with 25 songs Drake doesn't chip away enough to get there.